While energy is invisible to the naked eye, it certainly can be felt. Just think of the times when you have entered a house or building and felt uncomfortable. Have you ever met someone and felt their negative vibes right away? If you have recently moved to a new house and noticed you lose or break things and suffer more accidents than earlier, the chances are your new home is filled with negative energy. Yes, that`s right! Sometimes our homes or workplaces can possess negative energy. These negative vibes can range from simple bad vibes to nasty entities. In our modern society, the idea of things like bad energies is not accepted well, but, they are very real. They might hold you back from happiness with life. In fact, bad energies are even capable of making you physically sick! Plants are well known for their ability to purify the air. Having them in your home is a good idea, as their liveliness keeps negative energies at bay, increases positivity, and boosts overall mood. Sea salt is an essential ingredient in Feng Shui`s rituals for removing negative energy promoting a balanced flow of chi inside the home. Sea salt can be either used alone or combined with water and placed in a few areas of the home. Add a few tablespoons of sea salt in a bucket of water and mop the floors with it. Alternatively, place a bowl willed with sea salt in the corners of the house that face the southwest and northeast directions. Replace the bowls every two months. Have you ever heard of smudging? This practice has been used for thousands of years by people from different cultures. People burn sage to clear out the negative “ju-ju”. Burn the white safe, rotating it in a counterclockwise motion. 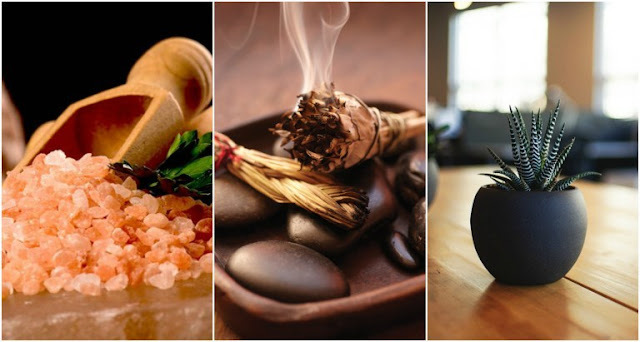 Essential oils are the ideal way to cleanse the home from bad energies. Some of the best for this purpose include lavender, patchouli, and frankincense. Just like unnecessary stuff take up space, negative energy do the same and make it difficult for vibrations and energy to flow. De-cluttering your home is one of the best ways to get rid of negative vibes in your home. Meditating once or twice daily delivers a potent positive vibration. The delivery from a meditative state of mind becomes more potent, making positive energy more potent compared to negative one. Proper meditation has been proven t fill the space with uplifting energy for a few hours. The simple act of moving things around promotes free energy flow and allows a new path for the negative vibes to escape. Other space clearing methods include clearing with chanting, clearing with bells, cymbals and singing bowls, burning eucalyptus in every room of the house, dowsing, and burning candles.